The idea of a video game that has you move around and basically exercise seems to go against the very foundation of video games themselves. However the VR treadmill is set to do just that. The equipment helps create immersive games that will have you physically interacting with the game. Sitting for long periods of times isn’t very good for your health so these VR treadmills are trying to make it so that players have an option of whether they want to play these games while getting some exercise. KAT Walk offers omni-directional and open construction. 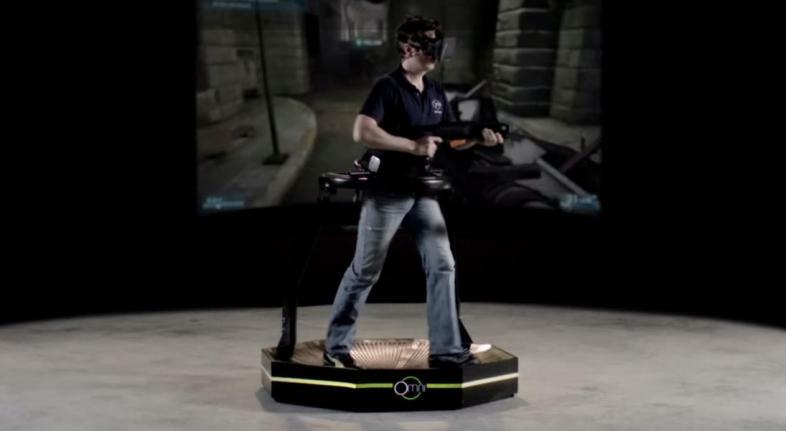 The omni-directional treadmill helps players move around in a small place while continuing to move around in virtual reality. The built in sensors will allow you to move in all directions as well as doing things like jumping and sitting. If a game requires you to do some movements that require sitting such as driving, you have the option to do so. The open construction of the KAT Walk makes it so that injuring yourself is less likely. You are more open to move around so you don’t have to worry about bumping into something. The amount of time it takes to learn KAT Walk isn’t much and makes any game with keyboard or gamepad support available. Infinadeck will have you fully immersed. Infinadeck is an omni-directional treadmill which uses a sensor that holds a belt to detect movement. You are free to explore the virtual reality world as the treadmill will go in the direction that you choose. Just like with KAT Walk, you are allowed to jump and sit as well. You can walk through beautiful scenery such as a forest or even the dark night. If you're a fan of a more rocky environment, then you can go there as well and move from rock to rock, basically training yourself in a way. You have no limits as you are free to explore to your heart’s content. The treadmill is quite wide and will keep you secure. The belt which will be wrapped around you helps to make sure you stay safe. Being able to go in whatever direction you please, going through your favorite game or great scenery, or just wanting the feeling of immersion, Infinadeck is a great option to all those who wish to do so as it is top notch and innovative vr treadmill. These VR treadmills help create an option for gamers who wish to stay healthy. While some don’t have the time or the care to exercise for a period of time, VR treadmills help to keep players healthy while also playing some of their favorite games. This will help create even healthier gamers, and even introduce those who don’t play already. This innovating creation is one that will give you countless fun and exercise. JRPG and fighting games fulfill me. Love a good dose of comics on the side. Writing is a passion and combining the things I love allows me to share that with other people.